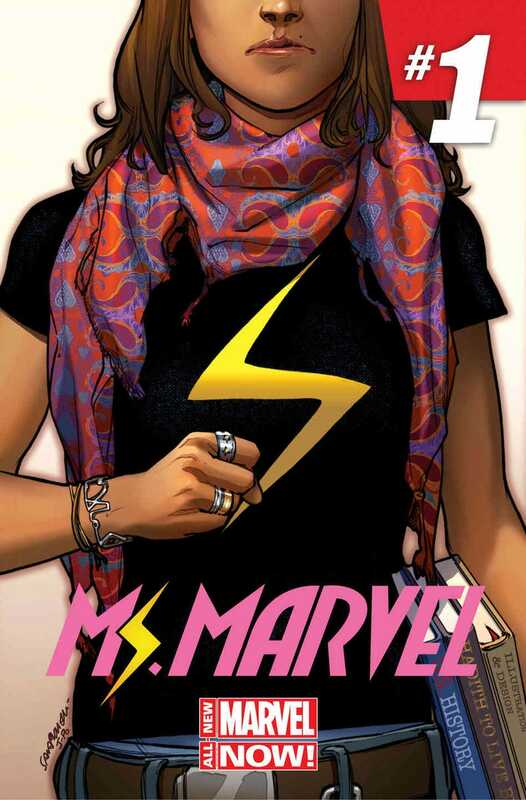 There's been a few articles about the new Ms. Marvel series on the main page leading up to yesterday's in-store and digital release of issue #1, but haven't seen anything about the actual issue. So here's my thoughts. I bought it yesterday from Comixology, using their app on my Nexus 7 (2012 ver), and also downloaded it to my Nexus 5 (I get the HD version on that). Even though I didn't have snow to brave through to get to a store, I was already home from work and on my couch and didn't feel like going back out. I won't go into the super-hero stuff, other than to say so far her origin story doesn't seem more or less ridiculous than any other superhero's, so that's all fine. It actually reminded me of the origin episode for Static Shock a little. Instead I will say that having grown up as an American in a (mostly) Muslim household, I thought they did a pretty good job portraying that. And this panel demonstrates that perfectly. ETA: there's another panel where she identifies herself as being from New Jersey, and not Pakistan, and that felt very spot on too. I'm male, so I probably had it easier than if I had been a girl, and me and my sister both had it easier than our cousins because only our dad is Muslim (by way of India) and our mom isn't, while my dad's siblings all married other Muslim Indians. Not that anyone had it hard, just that their parents were more strict. The main restriction we had as kids was the no pork thing, which was a lot more difficult in the 80s when people didn't seem to understand that bacon, ham, pepperoni, salami and sausage were all pork. Seriously, when I said I couldn't eat pork, people would ask about each of those things separately ("what about salami?"). We didn't even pray 5 times a day (or very often at all), and the only other thing I really followed was to fast during Ramadan, once I was old enough. Those are still the only 2 things I follow as an adult, since I drink and sometimes gamble. So I think they did a great job of portraying how it feels to be part of a (fairly common but still) minority religion. I've actually felt a lot of the ways Kamala's thought boxes show, particularly the "why can't I be normal?" one. I'm all better now, and have been for a decades but as a kid it can really make you feel out of place to be the only one who doesn't want pepperoni on your pizza, or to have to ask for an Egg McMuffin but without the meat (on a tangent, I still don't know why McD's doesn't have an Egg and Hashbrown McMuffin, there's plenty of Muslim, Jewish, and eggs-are-ok Vegeterians, so what the hell?). ETA: I just realized she even follows the Marvel Comics tradition of her first and last name starting with the same letter, and can join the alliteration club with Peter Parker and Jessica Jones. Anyway, there's my 5 cents. Looking forward to seeing how she does with her powers and what exactly they are.